In the spring we vertical jig walleye on the Detroit River. 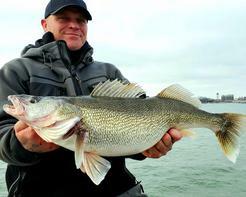 Typically by the end of march some times earlier ice starts to leave the Detroit River and millions of walleye run up from Lake Erie to spawn. 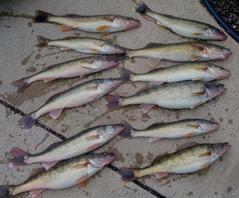 Not only do we catch daily limits, we catch 10 pound walleye often and also see 12-14 pounders hit the net as well. 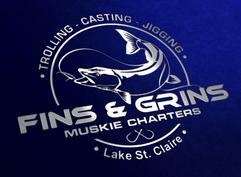 Our walleye trips will be offered from the last week of March through the end of May. The vessel is a ZX24 Skeeter with Humminbird Side imaging Sonar, 360 Imaging as well, Shimano / Okuma rods and reels. Call us at (586)350-0934 or send us a email to book your 2018 walleye trip.